Players are aiming to earn the most Prestige Points (PPs) by the end of the game which is 7 rounds long when the ball takes place. Players each have cards which represent their tailors and, at the start of each round, players select 3 of their available tailors to use during that round. Players then take turns using one tailor to perform 1 action and they can also carry out any bonus shown on the tailor’s card too. Tailors are either apprentices, journeymen, or masters and some actions can not be performed by the less experienced tailors, i.e. only journeymen and masters can make dresses, and only masters can hire new tailors. So, not only do players need to work out which actions they want to take that round but also which tailors they will use to accomplish that (based on the actions they can perform and their bonus action too). Working out which mix of actions will allow you to reach your goals and score PPs is entertaining, but you also must factor in the resources and cash you have (and might gain), the turn order, what actions other players might take, materials available for purchase, available scoring locations, etc. The halls offer an area control aspect to the game – the coloured discs show which player made what. 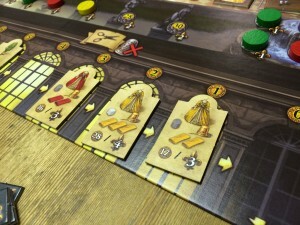 Actions allow players to buy materials, make dresses, make decorations, hire further tailors, fire tailors (removing the tailor card from your hand for cash), and become first player next round. The cloth/tailors available to be bought/hired each round are displayed and limited in number, which means taking your turn earlier in the round can be very important so you have more choice; however, there is a very nice game mechanic (for both cloth and tailors) which means it is cheaper to buy/hire when there is less choice – so going later in a turn at least has some benefits. When you pick tailors to use, you can only pick from your available (unused ones). If there aren’t any available ones, then all your used tailors become available again – so there’s a little bit of a deck-building element in the game. It’s good that you pick the tailors you want to use so there’s no luck of the draw – this also means, players need to think not only of which tailors they want to use this round, but which tailors that will leave them to choose from next round(s). When a player makes a dress they can choose to sell it for cash, or they can place it on the board in one of the spaces in the 5 halls (showing it’s been hired by a guest at the ball). At the end of the game, players score points for the dresses as well as for having the majority of dresses in each hall – so there’s an element of area control to the game too. Players can earn PPs in lots of other ways too like providing statues (which earn PPs and give bonus PPs for having made sets of different coloured dresses), providing musicians (which earn PPs, split ties for control in a hall, and count towards the ‘presence in every hall’ bonus), making part of the fountain (which can increase income), providing fireworks (which can potentially multiply the PPs from a dress in the top hall), using some tailor cards (some award PPs during, or at the end, of the game), and so on. When first reading the rules, it can seem that the points scoring is a bit bewildering but, like the other game mechanics in Rokoko, they’re simple but just numerous. 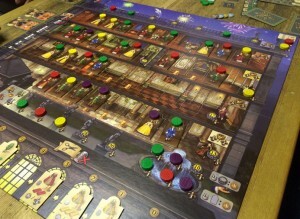 Across the bottom of the board are the dresses players can spend an action to make, each showing materials required (with a cash cost above them). 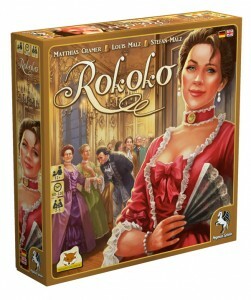 Overall, I found Rokoko a very interesting and enjoyable game – whilst the individual game mechanics are simple, there are a lot of working parts so there is a great deal to consider. I definitely felt like I’d had a decent mental workout by the end as there’s lots to process, a constant feeling of tension because one bump can potentially de-rail your plan, and you usually want to perform a lot more actions than you are able to. Also, I liked that whilst choosing your 3 tailors at the start of the round is very important, you decide what to use them for when you play them so you still have some flexibility during a round if things do not go as you expected/wanted. However, this flexibility is limited (so a plan is important) because you may find yourself without the right tailor, enough cash, enough materials, items have been taken by other players already, etc. It becomes apparent fairly quickly that money is very important because there are few actions you can do without it. Once all players have selected their tailors for a round, the game moves quite quickly as turns are relatively short so there wasn’t too much downtime; however, players sometimes need a little extra time to readjust their plans if someone takes an item, or occupies a space, that they were planning on using. Being 1 cash or material short at the wrong moment can really mess up your planned action so it’s important to tread carefully, so the game can be a little unforgiving in the short-term. Most PPs come from the end of game scoring so it’s not obvious who is doing well or badly during the game. One player likened that to Stone Age and I agree with that similarity. In my first games, I would quite like it if there was a mid-game scoring or two – not to actually score PPs but just to add up who would get what points if the game ended there and then. This would illustrate how players were doing, giving them insight and allowing them to consider their strategy or goals. New tailors are available for hire each round and these have a nice variety of appealing special abilities which can influence a player’s strategy. For example, near game end, I hired a tailor who converted cash into PPs, so I switched to selling dresses for cash instead of my plan to place dresses in the hall. The apprentices had good special abilities so were still useful/appealing even though they couldn’t perform all the actions. Different mixtures of tailors means most players each have a slightly different view of the game too – an aspect I always like. Managing which tailors you have (as you can fire them) can be important too – fewer tailors means you’ll use your tailors and their special abilities more often (but with less variety), and having experienced tailors gives you flexibility in your actions. There’s a bit of luck in the game if dresses to be made match the materials you already have, and whether materials that you need are available. However, this was acceptable because there’s a good amount of choice, and I felt my actions were what determined my performance, not the luck of the draw. Physically, the game looks great with lots of pieces and nice artwork. The iconography is excellent too. I have played with 4 players which works well. The more players there are the less control over your game because more changes between your turns. So, I’m not sure I would want to play with 5 players. Similar to Russian Railroads, there are two sides to the board so there are appropriately fewer spaces and choices available in a 2-3 player game of Rokoko compared to a 4-5 player game. In the end, I like the constant decision-making required in Rokoko as there are a lot of elements to balance and potential strategies for scoring PPs. It feels tense because all of your choices feel important – whilst you have options, making a bad choice (or an opponent’s unexpected action) can really affect you. I found I could make relatively short-term plans as I went, but I definitely needed a plan. Whilst its parts are simple, Rokoko felt like a game for gamers. 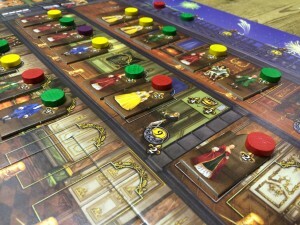 This entry was posted on Sunday, June 1st, 2014 at 1:55 pm	and is filed under Board Game Review, Board Games, Essen Spiel 13, Rokoko, Spiel 2013. You can follow any responses to this entry through the RSS 2.0 feed. You can leave a response, or trackback from your own site.